The previous post on this blog looked at whether the periodic increases in the minimum wage since 1950 in the US had led to jumps in unemployment of those workers making the minimum wage. It concluded that there was no evidence of higher unemployment resulting from the changes of the magnitude observed. And this was found whether by simply examining what happened to unemployment in the months following those sporadic increases, or in more rigorous econometric studies that have been undertaken over the last two decades. That blog post noted that despite those sporadic increases in the nominal minimum wage, the minimum wage in real, inflation adjusted, terms had still fallen significantly over the last half century. The minimum wage, in terms of today’s prices, had averaged about $9 per hour over the 25 years 1956-80 inclusive, and had reached a peak of $10.82 in February 1968. Yet the minimum wage is only $7.25 today. President Obama proposed to Congress in his State of the Union address that the minimum wage be raised to $9.00. This would be a modest goal, as it would bring it back only to a level of a half century ago. During that half century, US per capita GDP has more than doubled. Yet even that modest increase has been strongly criticized by Republican leaders and conservatives. Staying flat in real terms is an exceedingly limited goal. One would expect growth in a growing economy. And at $9.00 an hour, a full time worker (40 hours a week, 52 weeks a year with no vacation) would still be earning almost 20% less than the poverty line for a family of four. It is therefore of interest to ask what would the minimum wage be today if it were not simply flat in real terms, but had grown along with the rest of the economy? The graph above shows two scenarios. One is where the minimum wage would have grown at the same pace as overall labor productivity growth, and the other is where the minimum wage would have grown at the same pace as real compensation has for all workers. There are several points worth noting. First, it is very interesting that over the period 1950 to 1968, one finds that labor productivity, real compensation of all workers, and (with more jumpiness) the real minimum wage, all tracked basically the same path. This is as one would expect in a normal growing economy. Productivity grows, real wages grow at a similar rate (implying that profits will also grow at a similar rate), and similar increases in the real minimum wage will not create difficulties. But the trends then diverged. The minimum wage, set by government policy, was not allowed to keep up with inflation, leading to a significant fall in real terms. The deterioration in the real minimum wage was especially sharp and steady during the presidencies of Richard Nixon (1969-74), Reagan (1981-88, and carrying over into 1989) and George W. Bush (2001-2007). By June 2007, the minimum wage had reached a low of $5.75 (in terms of today’s prices) – lower than at any other point in time since before 1950 (I did not look at earlier data than this). The real minimum wage was $7.38 in January 1950, during the presidency of Harry Truman. It was 22% less in 2007, 57 years later. Labor productivity and real compensation of all workers continued to track each other for a few years after 1968. But then some divergence started to open up in the mid-1970s, and this divergence began to grow sharply from about 1982/83. It has continued since. This divergence between productivity growth and real compensation of workers since the 1980s has been noted and discussed before in this blog. It was noted there that the changes that occurred during the Reagan presidency, while lauded by conservatives, in fact did not lead to overall faster growth in output or productivity (growth in output and in productivity have in fact been slower since the Reagan presidency than it was before). But the changes that began during the Reagan term did lead to sharply slower growth in real wages, and led as well to a far worse distribution of income. The rich, and especially the very rich (the top 1%, and even more so the top 0.1% and 0.01%) have done extremely well since 1980. But as that blog post showed, the real incomes of the bottom 90% have grown only modestly (and almost solely in the second half of the 1990s, during Clinton’s term). By 2012, the average real compensation of all workers was fully one-third less than what it would have been had it grown after 1968 at the same pace as labor productivity growth. This is not a small difference. The causes for this divergence between labor productivity growth and real compensation of workers, largely since 1982/83, are not all known. Policy was clearly an important part of it. One policy was that of allowing the minimum wage to fall in real terms, which pulled down the wages of not only those at the minimum wage, but also the wages of those some distance above the minimum wage as the minimum wage affects the whole lower end of the wage structure. Reagan’s policies to undermine the ability of labor unions to bargain for higher wages were also a factor. Government policies to keep down the wages of government workers would also have contributed. But in addition to such policy factors, there were technological and other economic issues that probably contributed. As Erik Brynjolfsson and Andrew McAfee argue in their recent book, Race Against the Machine, the high rate of change in computer and communications technology, and the accompanying growth in robotics, not only diminished the demand for many middle class jobs such on the automobile production lines, but also for middle class jobs such as accountants, clerks, and other skilled positions where rules are followed which a computer can be programmed to do. This same technological change in computers and communications also enabled globalization of production. And the changes made possible by the new technologies led to the development of more and more “winner-take-all” sectors, where a few winners at the top can supply the whole market, leaving little for the rest. D. Could the Minimum Wage be Raised to Match? As the graph above shows, had the minimum wage continued to grow after 1968 at the same pace as overall labor productivity grew (as it had before 1968), it would have reached $24 an hour by 2012. Had it grown even at the slower pace that overall compensation of workers had grown, it would have reached $16 an hour. But I would not advocate increasing the minimum wage today to $24 an hour, or even $16 an hour. While the previous blog post had noted that changes in the minimum wage of a magnitude seen in the past had not led to higher unemployment, I am not so sure this would hold if the current minimum wage ($7.25 an hour) were more than doubled or tripled. Without more data, I would indeed be wary of a rise in the minimum wage to more than perhaps $11 or $12 an hour. One possible approach might therefore be as follows. 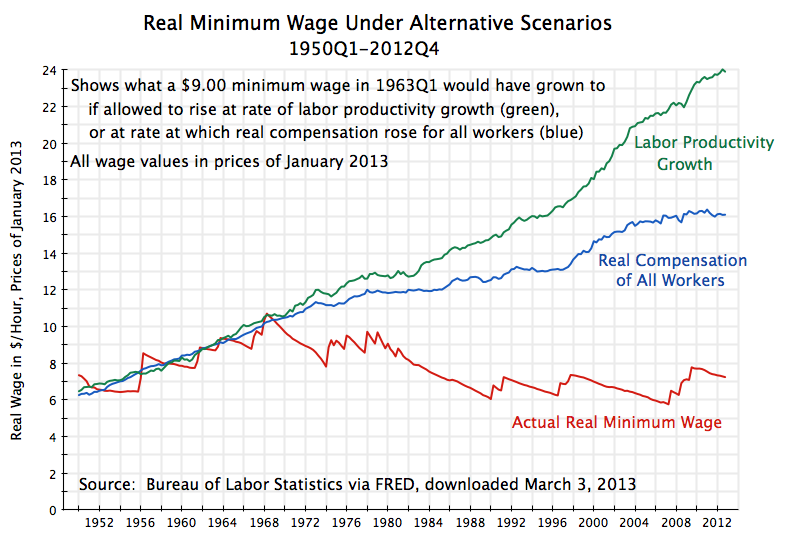 To start, one would raise the minimum wage to $9.00 an hour now, as Obama has proposed. Obama has then also proposed to index this rate to inflation, so that one does not again see the regression in real terms observed repeatedly in the past. But this would be too modest. One would raise the rate to $9.00 an hour now, then to $10 a year later, then to $11 a year after that, and so on. At each step, one would observe what the effects are. If the impact on employment of minimum wage workers is modest, one would continue. At some point one would start to observe significant adverse impacts, and at that point one would stop or even move back a step. The fact that raising the minimum wage to $24 an hour now, or even to $16 an hour, is considered unimaginable, and indeed would likely lead to significant adverse employment impacts, is telling. Something fundamentally flawed has developed in the economy which the US did not see before the 1980s. And it does such harm for the working poor that even a full time worker at the minimum wage will still earn well less than the poverty line income. There is a clear need to understand this better, but that should not keep us from following a more active approach, such as the step by step process suggested above, until we do. This entry was posted in Labor and tagged employee compensation, income distribution, jobs, wages by aneconomicsense. Bookmark the permalink.